Stepping out the door, everything is grey: the dirty snow, the overcast sky. I walk carefully on the ice because slow is smooth and smooth is fast. In the yards around the neighborhood corpses of inflatable Christmas decorations–Mickey Mouse, polar bears, penguins, and Santa Claus–lie as lifeless piles of nylon as if they were casualties of a great battle. Moms in giant black SUVs whiz by sipping their Starbucks. It’s January; we blew right past the “most wonderful time of the year” and are now living the reality that inspired the movie Groundhog Day. This time of year the roads are often too slippery to take my preferred mode of transportation–my road bike. So, I walk to the bus. I actually quite enjoy being outside for a few minutes at the slower pace. It gives me an opportunity to ponder or think about something that’s not identifying puddles in the house or debugging software. If nothing else it forces me to be on time because I have to conform my life to the Regional Transportation District’s schedule. Being on time can be a real problem, though. In a tight morning schedule the thing that most often gets cut is breakfast. All too often I step into the kitchen at T-minus 3 minutes and just grab the first thing I find to eat that can come with me, which is unhealthy (candy), insufficient (breakfast cereal), or weird (summer sausage). 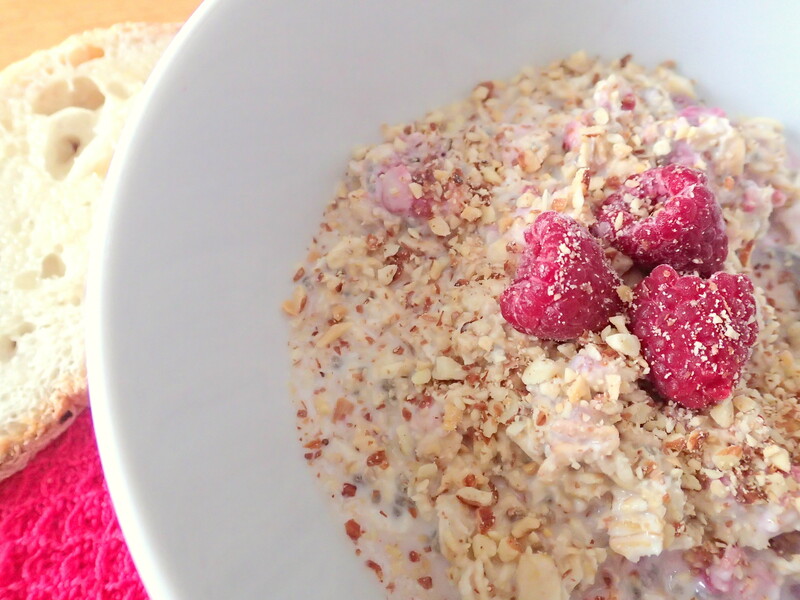 These oats know your morning time is scarce. A few minutes of prep before going to bed gives you a hearty breakfast in a sealed container you can grab and throw in your bag in seconds. It has way less sugar than breakfast cereal while being more delicious. The Greek yogurt and chia seeds give it enough protein that you won’t crash during your 10 o’clock meeting. Just do it. Your co-workers will thank you for not being hangry. 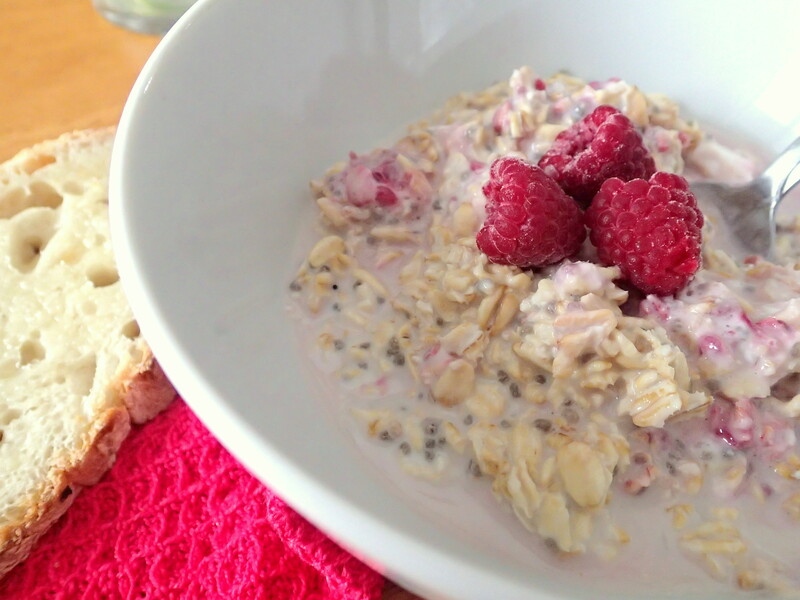 Inspired by Annie’s Eats Banana Cream Pie Overnight Oats. 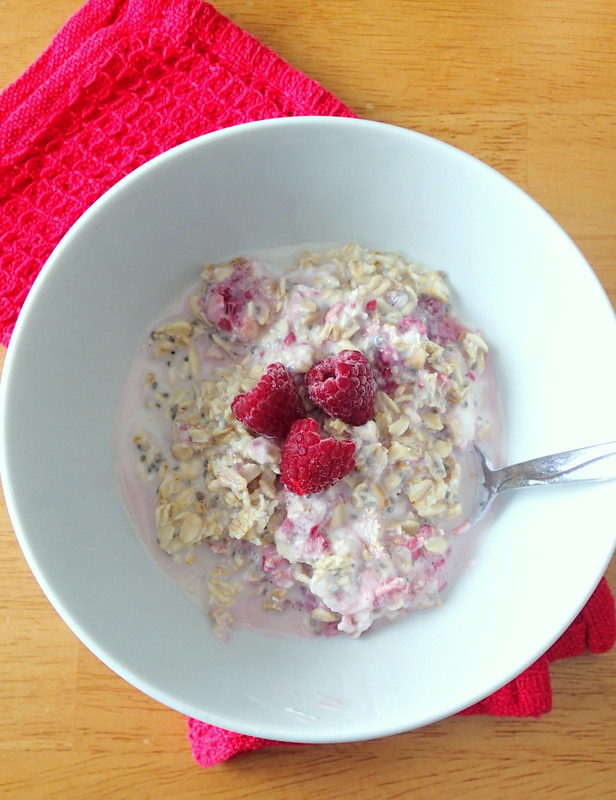 Optional: more raspberries, sugar, or chopped nuts for topping. 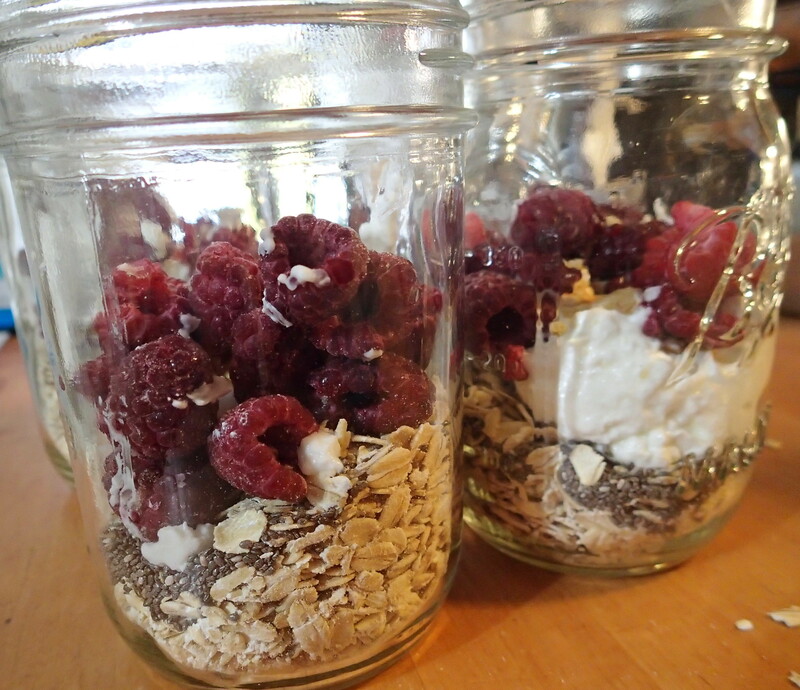 Combine everything except for the optional toppings in a mason jar. Put the lid on and shake vigorously until well mixed. It may take a minute or two to get everything evenly distributed. Refrigerate overnight and pull out the next morning and sprinkle with any desired toppings.